Set in historic downtown Sanford, the event showcases a beautiful setting with Lake Monroe within walking distance, shops and dining and a large historic area. The festival takes place outside on brick lined streets close to city parks. 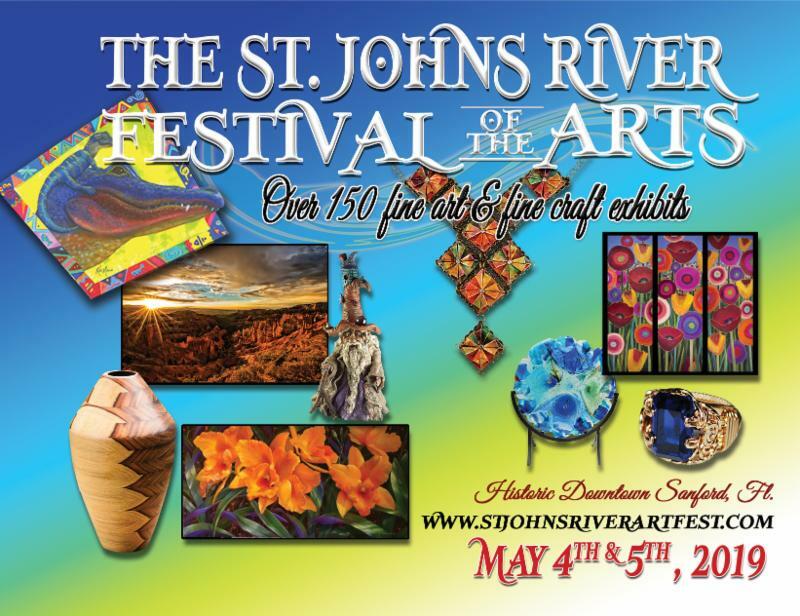 The St. Johns River Festival of the Arts is committed to promoting the arts and culture to our community. Art education is an integral part of our mission and has resulted in our Art for Kids program that offers art instruction to all students who have a desire to learn at no cost if unable to pay tuition. We support the arts and the belief that art is an important part of our humanity. The festival features fine arts and fine crafts from over 150 artists. We offer demonstration venues for our attendees with demonstrating artists receiving a waived booth fee for demonstrating during the show. We have fine food vendors in a Culinary Arts Court along with acoustic music by regional musicians. Each year we add something different to the event, whether it be interactive or stand alone. We look forward to surprising our artists and public. Extensive marketing in all mediums including lighted bill boards on I-4, printed media, social media, radio and WUCF, public television.